A new survey has identified millions of hectares of forest in dryland areas, boosting the total global forest cover by 9 per cent. 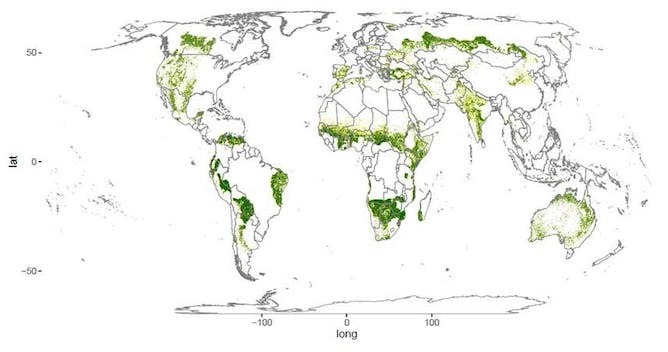 A NEW GLOBAL analysis of the distribution of forests and woodlands has “found” 467 million hectares of previously unreported forest – an area equivalent to 60 per cent of the size of Australia. The discovery increases the known amount of global forest cover by around 9 per cent, and will significantly boost estimates of how much carbon is stored in plants worldwide. Given that drylands – which make up about 40 per cent of Earth’s land surface – have more capacity to support trees and forest than we previously realised, we have a unique chance to combat climate change by conserving these previously unappreciated forests. Andrew Lowe is a Professor of Plant Conservation Biology at the University of Adelaide and Ben Sparrow is Associate professor and Director of TERN AusPlots and Eco-informatics, University of Adelaide.